At the end of a busy week for the new Miami Marlins, the optimistic team unveiled their new logo and uniforms as Jeffrey Loria expressed his desire to create something amazing with this team. He expressed his point that the Marlins will be Miami’s own, and the glistening stadium at Miami’s center would do just that. Loria continued by speaking about Miami’s culture, and how the ballpark will reflect that iconic South Florida lifestyle. 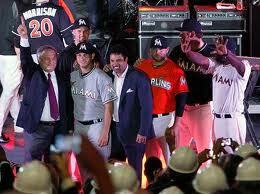 Moments later, he tossed the old “Florida” Marlins cap into the crowd and revealed the new Miami Marlins logo. Supporting the idea of the team reflecting Miami culture, he explained the new colors. With the new name, uniforms, and park, the Marlins are looking forward to a new beginning, one that will allow the team to expand payroll, and contend with a core group of players.The Marlins were limited while playing at Sun Life Stadium. They owed a certain amount every year to the Dolphins, and couldn’t support a pricey team as other high market cities can. The un-friendly baseball venue did not attract fans, and thus the team could not support a strong fan base. But with the new “Miami” symbol, the team hopes to instill in the hearts of Miami sports fans the passion of this club to bring a winning Major League baseball team to the great city. The Marlins are especially looking to draw in the hispanic crowd of Miami, and may do so further with the signing of Albert Pujols or Jose Reyes. But there are still doubters and haters alike who are not buying in to this whole rejuvenating motion of the Marlins. I recently read an article on Yahoo by Jeff Pasaan, who completely took the wrong approach in the advertisement of this new team. Pasaan looked on the negative side of the Marlins history as far as their negative fan base and fraudulent financial reports to convince Miami-Dade County directors to fund the new stadium. He doubted a raise in attendance for 2012, and bashed the Marlins hopes of winning. His sleek journalism skills might unfortunately draw baseball-naive readers into agreeing with his negative analysis. It looks to me like Pasaan only writes about what he wants to jeer in sports; even his picture looks negative. Enough with the bashing, but I am sure Pasaan is not the only one who is pessimistic about the Marlins future. He mentioned a lot of teams in the article who built new stadiums and didn’t get the attendance they hoped for, and also said that lousy fans of these teams only respond to winning. That is mostly true, but also deceptive. Aside from the select few teams who will always have a passionate fan base; such as, the Phillies, Yankees, Red Sox, and probably the Giants; almost every team has fickle fans who only respond to a record above .500. But sometimes, like in the Giants case, a beautiful ballpark and city will nullify the need for winning in order to attract fans. Of course, a winning team in San Francisco exemplified the fan base. So even bad teams with a great city and stadium can earn the money needed to support an eventual winning club. One more example, the Houston Astros, who are in a similar geographical situation to the Marlins. The city lies right on the coast of Texas next to the Gulf of Mexico. They draw fans from Houston and to the west, from San Antonio and Austin. But other than those, there are not very many populated cities within close proximity to Houston. 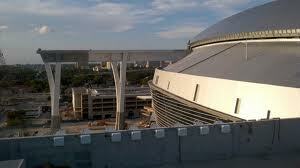 But the fans the city did have responded to the new ballpark. And this year, I saw it in person. On a weeknight, against the Nationals, the-30-games-below-.500 Astros drew close to 29,000 fans. Can you think of any better reason NOT to go to a game? Yet 29,000 fans chose to support their hometown club despite the horrendous season. So Loria’s vision of drawing 30,000 fans on a nightly basis next season does not seem out of the realm of possibility. And the Marlins have done what they can so far to attract the city of Miami. Now it’s the fans turn to respond to the team. I’m from Miami. Fla is my national league team. And I canNOT stand the new logo. What do you really think? To me, it looks like the logo for a cheap graphics company. I see where you’re coming from, and I agree with you for the most part. It’s supposed to be original, but it’s not creative at all. I was hoping for something cool, and was disappointed. I’ll get used to it though. Was talking to a fan from South Florida today and he felt the Marlins should have kept their “Florida” namesake instead of segmenting their Broward/Brevard/Dade county fan base by taking the “Miami” essence on full-time. While I see the rationale from both sides of the fish tank, it still might lead to some fragmentation of the outer schools of “fish fans” who might migrate into Miami for games. On the bright side, I applaud the team for including the “flying Marlin” into the final logo on the caps. The earlier leaked prototypes seemed to eliminate this great characteristic and it would be criminal to abort that vital piece of their past That is their true symbol, the marine essence and the heart and soul of the Fish Nation. Now the Marlins fans will voice their own levels of approval or distaste for the changes with their merchandise dollars this off season. Well I liked the “F” logo for the Marlins, and you’re certainly right about the leaping Marlin. But I think there was also pressure from the MLB for the Marlins to change their name to Miami because of the fact that Tampa Bay has established themselves, and the Marlins are not the only Florida baseball team. But the main reason for the name change was the team’s choice. It’s part of the whole “rebranding” movement, and I don’t really mind it. As for the merchandise, I hear it is selling well. Hopefully the new brand will rub off on the city and draw in those fans. I have mixed feelings about their uniforms. They appeared completely hideous and ugly at first sight. But when I look at them now, they seem kind of unique. I think I could get used to them. There have been mixed feelings in general from the public about the new uniforms, but after all, they have sold well in Miami stores and are very unique.